The best of two Ann Arbor tracking programs! 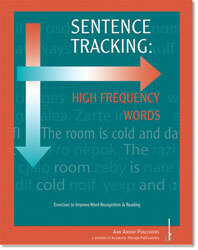 Uses the same model sentence approach as the time-honored Sentence Tracking program but includes the Francis-Kucera word list that is used in the best-selling Word Tracking: High Frequency Words. Without even knowing they are doing so, as students master tracking skills, they will also become familiar with approximately 500 sight and phonetic words that are commonly found in everyday language skills. This program was actually created on demand by users of our two most popular tracking programs. 2nd to 3rd grade level. Type size ranges from 18 to10 point. Reproducible.